Angela Kerins quit her role as Rehab CEO yesterday. 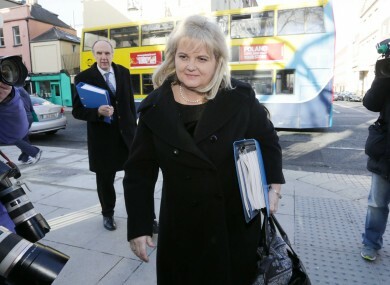 THE RESIGNATION OF Rehab CEO Angela Kerins will be discussed by the Public Accounts Committee (PAC) this morning. Kerins had been called before the committee to discuss her salary and the disability support group’s profits among other issues. She and Frank Flannery, the former CEO of the Rehab Group, are due to give evidence to the committee on a range of issues relating to the service level agreements between Rehab subsidiaries and State bodies, the pay of executives at Rehab and the use of funds received under the charitable lotteries scheme. The committee said that it notes Kerins’ resignation, but said that it has not received any correspondence on the matter. “While the Committee has not received correspondence from Rehab arising from the decision of the CEO to retire, it will discuss this development tomorrow when dealing with housekeeping matters relating to its on-going work programme,” said a statement from PAC. Health Minister James Reilly said that all people who are called before a committee should do so. Email “PAC will discuss Angela Kerins' resignation today”. Feedback on “PAC will discuss Angela Kerins' resignation today”.